This month marks the beginning of our 2011 lessons season. This program, in partnership with Wakulla County Parks and Recreation is the SPSC’s best way of supporting the local community for our access to the beach. Bob Andrews has been lesson coordinator for the last couple of years and has been doing a great job herding the cats to make the lessons program happen. Our sessions are filling up fast already, so please check the calendar to see when you can help. We try to keep a high teacher to student ratio to make the lessons a quality experience for our new windsurfers. When I decided to try windsurfing a few years ago, I had last paid attention to windsurfing in the late 1980’s. I expected that there would be schools, shops and equipment available. Now I know that SPSC is the only venue for windsurfing training this side of Tampa, so please help us bring more people into the sport. Here are a couple of rules for our new students gleaned from my vast experience. This year’s Stephen C. Smith Memorial Regatta was a resounding success. We helped raise a substantial sum of money to help the American Cancer Society in their fight against a disease that effects us all. The SCSMR foundation and board did their usual stellar job in bringing all the aspects of this event together. Thanks to Perry and John for setting the marks, Mark and Lee for captaining the races, and Tina for bringing together a C fleet. I do question the propriety of a racer, our own scribe Bobby G., scoring the races, but since he didn’t win anything, I guess he hasn’t figured out how to game the system yet. PS: Tiki Mon IV is safe in an undisclosed location, to thwart the unscrupulous and unprincipled scoundrels who tried several times to hold him for ransom. As the dust settles on another Smith Regatta and TIKI MON IV settles into his new home with Bill Olson, I reflect on the past year that TIKI MON IV was my companion. I introduced TIKI MON IV at the NIMBY regatta and he was immediately welcomed by all those in attendance, finding out what kind of partying crowd he was amongst. Needless to say, but with this crowd, TIKI MON IV’s tramp stamp was the envy of everyone. We made our next appearance at the Rum and Rootbeer regatta, enjoying the gambling and good times. I would say more, but what happens at Shell Point stays at Shell Point. It was TIKI MON IV that made hanging out at the beer truck at Endless Summer Regatta a great time. For the first time in the TIKI MON dynasty, TIKI MON IV made it to the Atlanta Fall classic and was treated like royalty, as he should have been, spending most of the event in the warm confines of the yacht club and near the liquor cabinet. Sitting by the huge fire place made for some nice photos, but TIKI MON IV knew some of his lesser brethren were what was keeping him warm, so he preferred a more comfortable setting on the beautiful wooden bar, next to their historic wind shrine box (filled with items added one by one each year by a different keeper for what looks like many windy years) a good time was had. 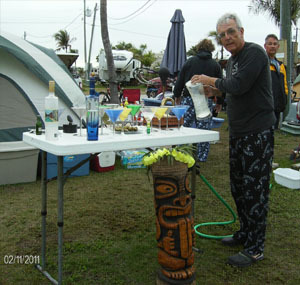 The next TIKI MON IV sighting was on the bar at the glamorous SPSC Christmas party in beautiful Wakulla County. He was working at that event holding the lights in place. What an event to remember. In February, we traveled to the Keys where previous TIKI MONs have been known to cause rifts in relationships. Man what a life and time TIKI MON IV had! He spent most of his vacation moving from camp site to camp site, hosting an epic twister game or two, and sneaking into as many tents as possible. Who could forget TIKI MON IV the 2011 Wind Ceremony, overseeing our historic “wind wish stick” tradition . Our great Swami was appreciative of the attention TIKI MON IV was getting, since TIKI MON IV was by his side the whole time, worshipping at the feet of the great Swami. Using only the finest imported Brazilian wood sticks, TIKI MON IV had the hook-up on good wood and good wind. From his creation before the NIMBY in 2010 to his finding a new home at the Smith Regatta charity auction in 2011, the year flew by quickly. We are honored by the attention TIKI MON IV received at the auction and are humbled and thankful for it. Now I look at my log drying rack for the next tiki, TIKI MON V!! I still have a few of what I call the Daytona beach logs which I picked up on A1A after two hurricanes crossed the state few years ago. They were from a very old palm in front one of the oldest condos on A1A that had been blown down then cut to perfect tiki length and stacked up. I filled the trunk of our rental car and threw a few in the back seat. Tiki Mon III and IV have this as their heritage. This year’s Rum n Root Beer, on August 6th, will be chaired by yours truly, BobbyG aka B3 aka Bob aka Graves, aka sh&$head, with lots of input by His Excellency, the one and only, El Commodore himself, Bill. The theme is “1 Million Years BC”. Now, there are the purists that contend that 1 million years ago there were no humans, yet there are countless movies and cartoons that depict humans and dinosaurs together. If you can’t trust the media, who can you trust, history and science books? I don’t think so. This is the age of tweet and Facebook, the truth is irrelevant, so get over it. Also, BC does not stand for “Before Clamp on boom, Before Cambers, or Before Chinook,” or anything windsurfing related for all you board heads that are of a single mind. When thinking of how to get in the mood for this event, watch the Flintstones, the movie “1 Million Years B.C.” starring Raquel Welch (I know I have and will again), “Caveman” starring Ringo Starr, and read the comic strip, Alley Oop. I know there are lots of other movies out there, so watch them all to know how it really was 1 million years ago. Games will abound, with all of them testing the base instincts caveman had, and some they wished they had. The games will take you in the water, on the shore, hunting for your food, finding a mate, discovering fire and the wheel, and attacks by Dilophosauri, spitting raptors. All this will take place amongst active volcanoes on a sandy beach encrusted with prehistoric shells. There will be gifts galore (at least one), and fun to be had by all ages. We are considering breaking all attendees up into two or more tribes. We do not intend to have any turf battles, so hopefully none will crop up and we can avoid bloodshed. But who knows, because "What happens at Shell Point, stays at Shell Point." Meeting called to order at 7:36pm. Normally when his Excellency speaks, we just ignore him, but the gavel came down and we all focused. There were 17 people in attendance, down from the last meeting. People are scared of the gavel. Don Reeder, a new member, was in attendance and introduced to the masses. Welcome Don! Discussion on upcoming event ensued, started, began, commenced, whatever. Discussion on the Smith regatta about food on Friday night began. Wharf on Wheels will not be able to make it down, drawing multiple groans from the crowd. (Don Franklin came in, and there are 18 members present). Linda talked about cooking hot dogs by the beer truck on Friday night and selling them to those who need to be fed from either 6pm-8pm or 9pm. The details, obviously, have not been worked out yet. 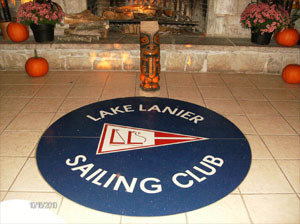 Someone asked who would be doing windsurfing registration and Mike L. mentioned Laurie would, with assist from others. Bob G. asked what the point of wind surfing registration was since everyone lied about their weight, age, gender, and what sail number they will be using. Bob was told to shut up. Mike asked if there was anything for kids to do at the Stephen C. Smith. Other than be quiet and stay out of the way, other suggestions were made that were deemed more constructive. His Excellency, Bill, gave kudos to Mike Levine on the Wind Ceremony who, after taking multiple bows to the cheers of the crowd, mentioned there are 6 large and one double xl shirts left. We did not lose money on the Wind Ceremony. (Wright arrived at 7:48pm) Perry asked how much the shirts were. Mike started to negotiate but negotiations halted when everyone yelled "They're still $20 Perry!" Wonder how many shirts we have now and what kind of deal may have been cut later. Wright indicated he still needed to get the Paypal money Deb collected which he estimated at between $300 and $3,000. Hopefully Wrights engineering measurements are more accurate. During the Wind Ceremony, we collected money in selling non wind ceremony shirts and in membership fees. We have an insurance bill coming up, payment to US Sailing to remain members, and some corporate filing fees. I thought our governor was going to get rid of all corporate type fees. Dang. We have 48 memberships of both single and family variety which means we have more than 48 physical bodies as members. NIMBY has been moved to June 17-19 in Gulf Breeze at the Bay Beach Inn. A dozen rooms have been reserved in Wrights name. $89 for a room for either a King or two Queens. I wonder who the queens are? Wright will be sending out an e-mail. Gary from Isthmus Sailboards asked what we needed for training equipment. Bob A. mentioned we will start small in our requests so as not to scare him. Option 3a was the clear winner. I'm forgetting what option 3a is, but it should be available soon. Possibility the machine could notify you when the wind picks up so that you feel bad that you can't make it when it's blowing really hard. No additional cost to the club for option 3a, though members are donating equipment and time. Thanks, Lee! Guy motioned to adjourn, Mike seconded and the Commodore came down with the gavel adjourning the meeting before asking if all were in favor, a complete disregard for the rule of conduct during meetings. Damn the gavel. I think the gavel is beginning to control the Commodore.